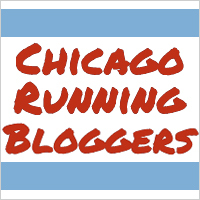 I was a little angry with WordPress after it ate my lunch post yesterday. I also ended up having a much later night than originally intended. Lunch yesterday was an even more delicious repeat of Tuesday’s salad. 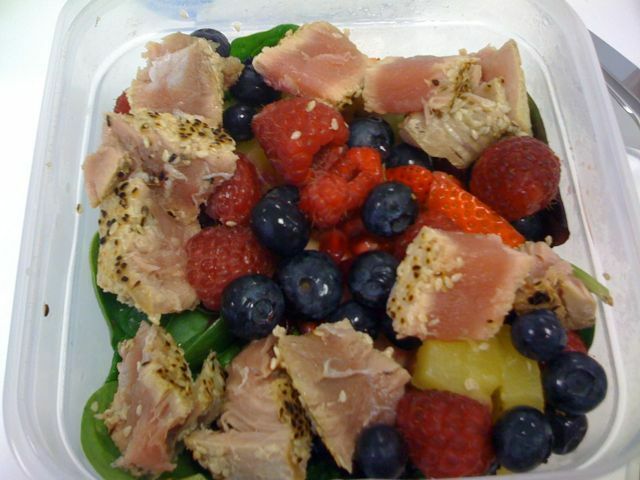 The only thing I love more than a big salad chock full of fruit is a big salad chock full of fruit and some yummy ahi tuna on top. 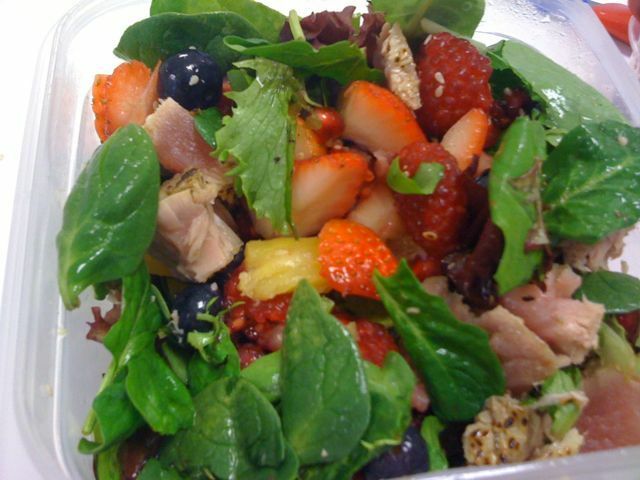 In the mix we’ve got baby spring mix, baby spinach, strawberries, blueberries, raspberries, pom arils, pineapple, and ahi tuna steak leftover from Wednesday night’s dinner. This salad was ginormous! There was a full pound of fruits and veggies. I topped it with some Cranberry Balsamic which I didn’t find especially impressive. 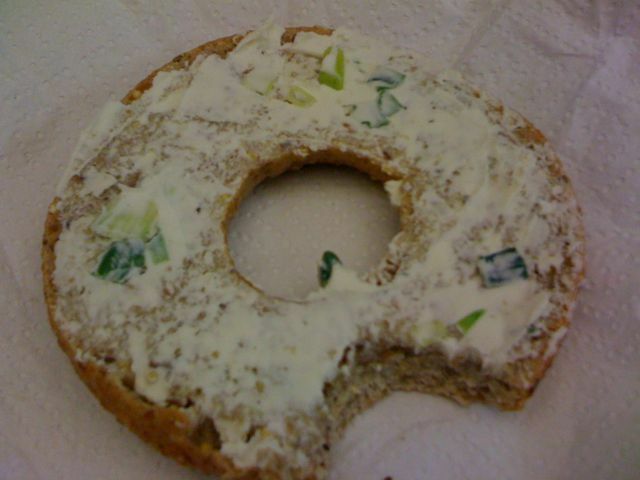 Along with my salad, I had half a whole grain bagel from Panera with some fat free veggie cream chese. As filling as my giant salad was, I find if I don’t eat something a bit heavier with my salad I don’t stay full for very long. After work I headed to my friend Nik’s house for some quality time. I haven’t hung out with him in a while and we both had a free night. Nik offered to cook me dinner so I make dinner for him all the time. We usually have Blackhawks + dinner hang-out dates. I agreed to make the dessert. Nik made use Chicken n Rice with Salsa which I failed to snap a photo of. Basically it was white rice mixed with cream of mushroom soup, topped with chicken and baked for a while. The dish was topped with salsa and baked a little longer. 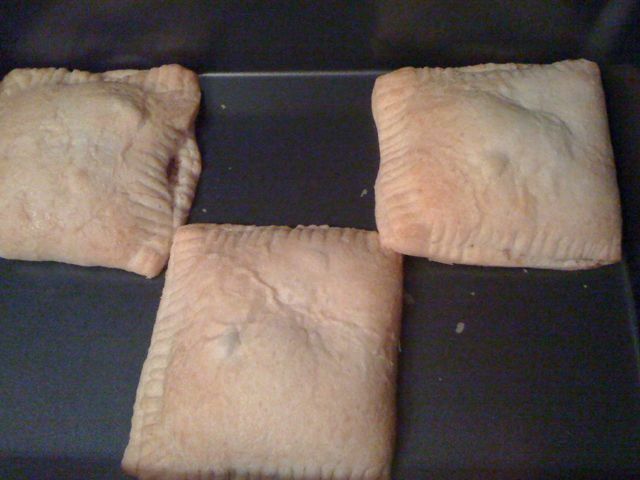 I made apple turnovers for dessert. I’ve had a can of Lucky Leaf Lite Apple Pie filling in my pantry since I won the Musselman’s gift basket from The Daily Balance back in December. I kept intending to do something with it and never got around to it. I figured it was about time. The apple turnovers didn’t quite go as planned, but things ended well. I bought fillo dough, but I think I had intended to buy something else because this is not what I was expecting. Trying to use the fillo dough was epic fail. I wasn’t sure what the heck I was doing. The dough was falling apart. I had no idea how I was going to get it to stay sealed. After about 5 minutes I said eff this and ran to the grocery store down the street for Pillsbury seamless cresant roll dough to make some “cheater” apple turnovers. The pie filling was also pretty lame. Obviously it was no sugar added which was fine, but there was no flavor added either. While I was at the store buying my cheater dough, I grabbed some cinnamon. Several large shakes of cinnamon greatly improved the flavor of the pie filling. The final product wasn’t quite what I was hoping for, but it was damn tasty none the less. Around 9:30, I headed to the bowling alley to meet some a bunch of friends. I didn’t plan on staying very long at all, an hour or two at most. The next thing I knew it was midnight! I guess time flies when you’re having fun! I didn’t get to sleep until nearly 1am so it pretty much goes without saying I was seriously dragging this morning. 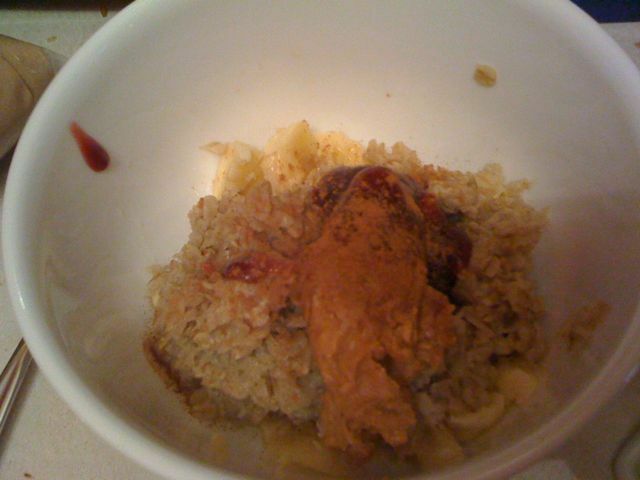 Breakfast was the usual bowl of oatmeal with chunks of banana, peanut butter, and cranberry apple butter. I also shook some cinnamon on to it since the jar was sitting on the counter. I wasn’t sure it would mesh well with the cranberry apple butter, but it was pure yumminess. 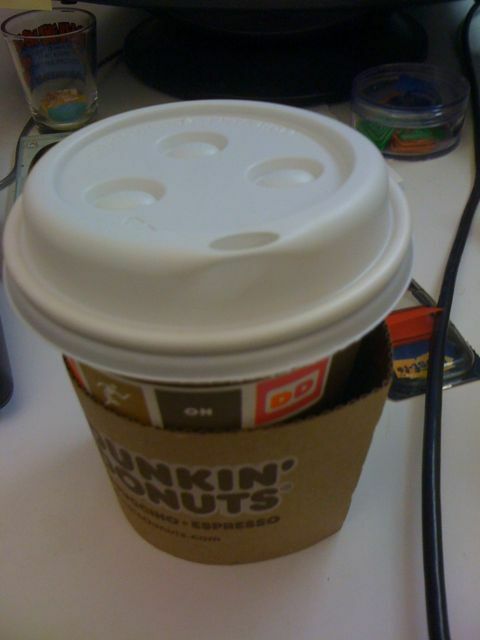 It was also coffee needed kind of morning so on m way into the office I stopped at Dunkin Donuts for a small coffee. I’m not sure this really meets the guidelines of responsible spending, but I’m making an exception. I very rarely drink coffee – maybe once a month – so I don’t buy coffee for the house (I don’t even own a coffee pot!) Plus, since I don’t drink much caffeine, it doesn’t take a whole lot to get a good pick-me up. I spend $1.10 on coffee this morning. Well, it’s lunch time so I’m off! I’ll be back shortly though!